Florida will soon feature one of the most advanced passenger rail systems in the United States. While the concept of higher-speed passenger rail in Florida has made national headlines, the fact that AAF is also developing dynamic mobility-centric urban centers of Transit Oriented Development (TOD) around its stations is a noteworthy topic in its own right. 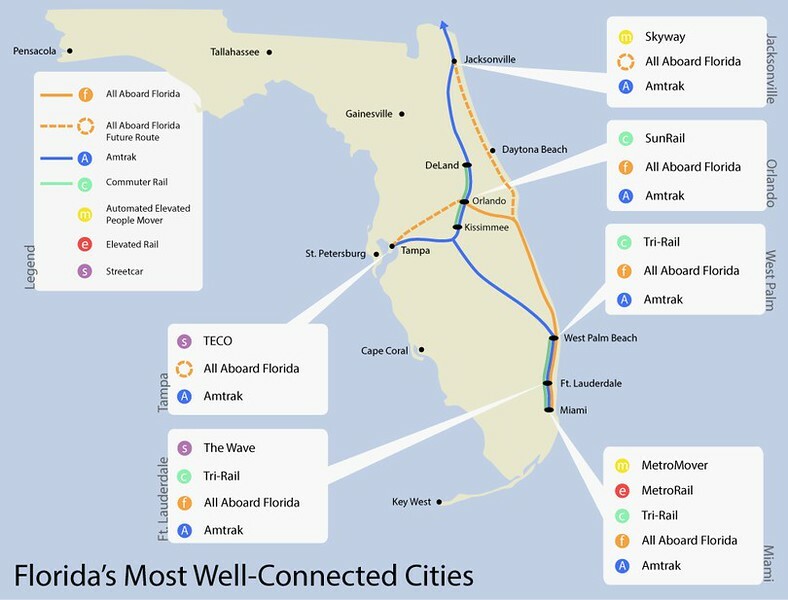 All Aboard Florida is a part of Florida East Coast Industries (FECI), a parent company of successful operations in real estate, transportation and infrastructure. FECI is one of Florida’s oldest commercial real estate, transportation, and infrastructure companies, with 19th century ties to Standard Oil tycoon and railroad magnate Henry Flagler. All Aboard Florida (AAF) develops innovative multi-use community spaces that incorporate a unique transportation service. That unique transportation service, the Brightline, will be the country’s first privately owned and operated passenger rail system in over a century. Already under construction, AAF plans 16 daily departures from both Miami and Orlando, with stops in Ft. Lauderdale and West Palm Beach when fully operational in 2017. Each trainset will feature ergonomic seating, wi-fi, level boarding, and meet ADA compliance standards. Express trains will be able to make the 235-mile trip between Miami and Orlando in about three hours, traveling at 125 miles per hour. The company has also indicated in its contract with the Central Florida Expressway Authority that an extension to Jacksonville is a real possibility. While the concept of higher-speed passenger rail in Florida has made national headlines, the fact that AAF is also developing dynamic mobility-centric urban centers of Transit Oriented Development (TOD) around its stations is a noteworthy topic in its own right. Here’s a look at what’s proposed and what could potentially take place if the system is expanded to Jacksonville and Tampa.